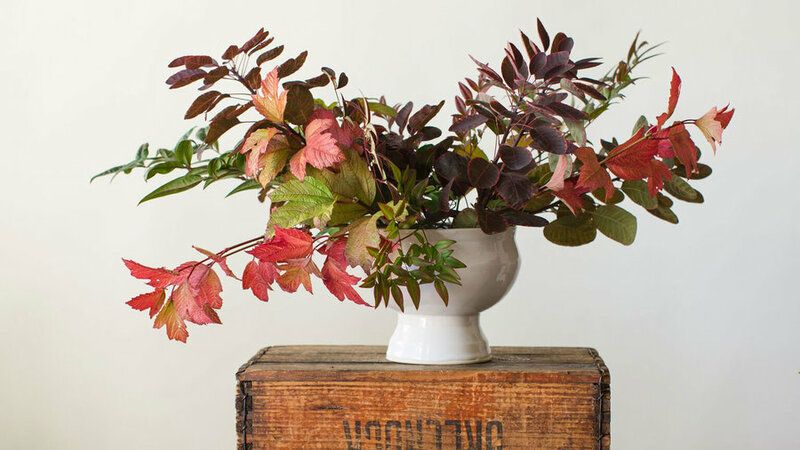 Bring the bold colors and rich textures of fall indoors with a sumptuous autumn arrangement. 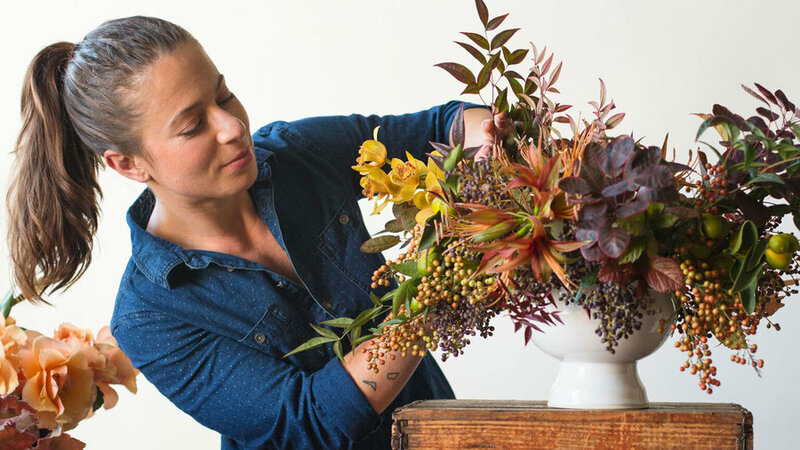 Eleanor Gerber-Siff, owner and lead floral designer of San Francisco-based , showed us how to create this stunning centerpiece and shared a handful of tips for pulling off a show-worthy arrangement at home. 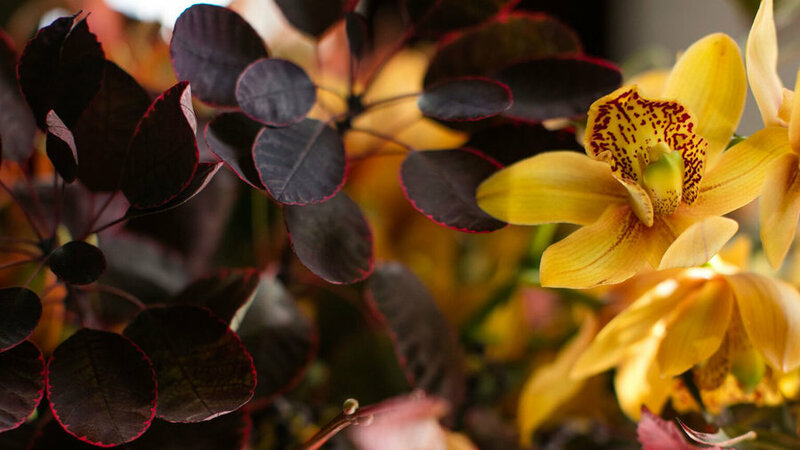 Here, she’s chosen deep chocolate-colored smoke bush leaves and russet-colored viburnum foliage as well as golden ranunculus, amber-colored cymbidium orchids, red strawflowers, and sprays of privet and nandina berries. To make a centerpiece of your own, you’ll need (pictured left to right): a sharp knife, clippers, floral putty, and a floral frog for securing your stems in a shallow vase or compote. 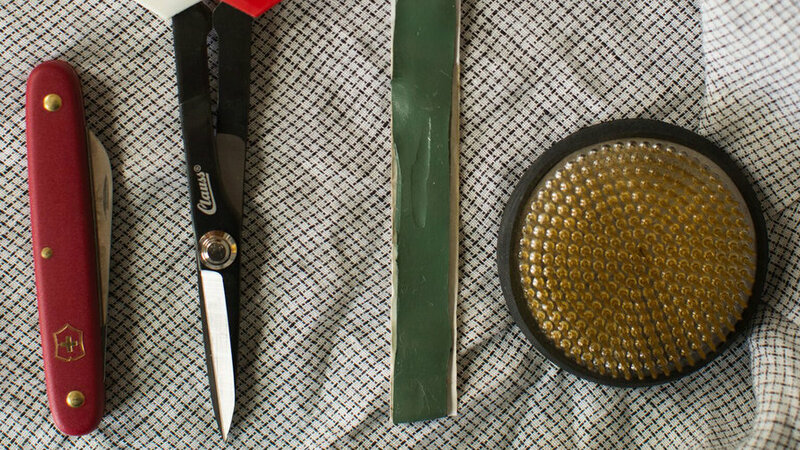 Eleanor uses the pocket-knife interchangeably with the clippers to cut stems and trim leaves. 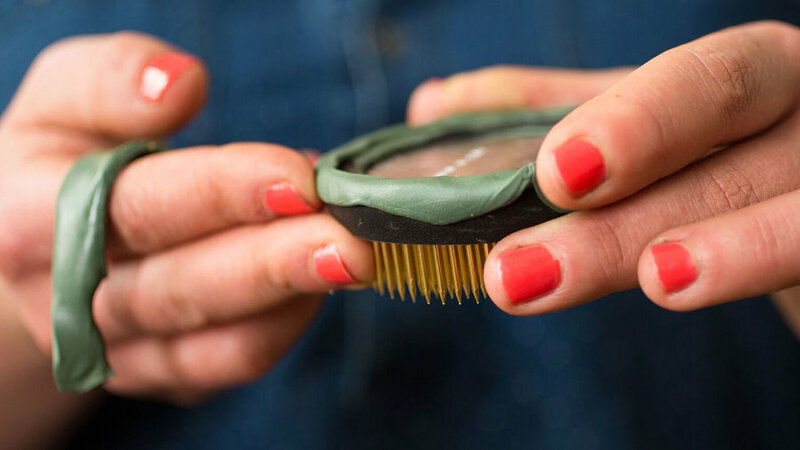 Prepare your floral frog by attaching a strip of floral putty around the outer bottom edge of the frog, pressing to make sure that the putty tightly adheres to the frog. Then, lay a towel over the pins to protect your hands and press the frog firmly into the center of your vase. Bumping up your vessel on a crate can make it easier to have a good look at the arrangement as you work and can be particularly helpful when using a low vase. 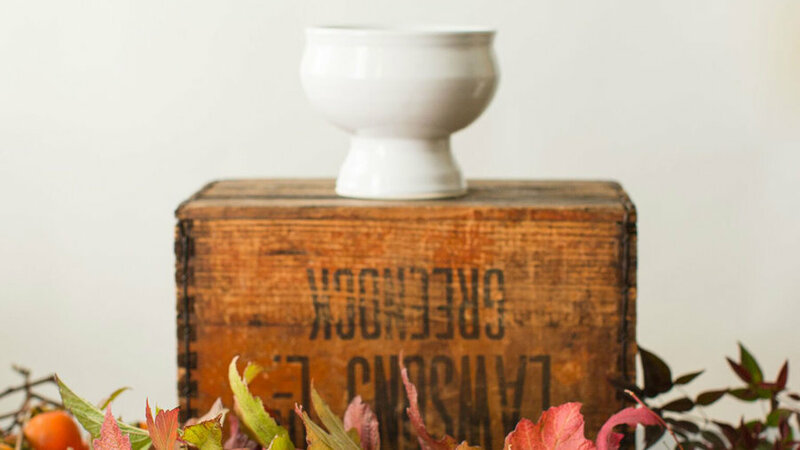 Eleanor likes using a low ‘compote’ as a vessel—this one is made by Britt Gerhard of in San Francisco—because it allows the arrangement to sprawl out for a loose, natural look. Before adding fall flowers or berries, make a secure base with the foliage to establish the structure for your centerpiece. Press each foliage stem firmly into the floral frog and arrange the stems in four quadrants. Eleanor inserts each branch at an angle of 45 degrees or greater to form graceful arcs of foliage. The grid of crisscrossing stems also helps hold more delicate flower stems in place. Remember to rotate the vase as you go so the arrangement is balanced. 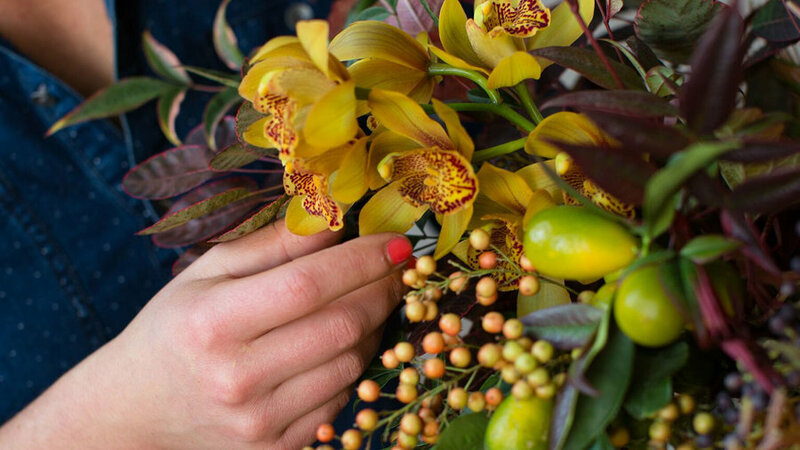 Once you’ve added enough foliage to form the base of the bouquet, begin adding sprigs of berries, branches of small fruit, and other textural elements. Eleanor used orange nandina berries, purple privet berries, and branches of kumquats. Push any top-heavy stems (like the kumquats) securely into the frog at the bottom of the vase to prevent them from falling out of the vase. Finally, add the fall flowers. Look for natural dips and pockets among the sturdy branches of foliage where your flowers can rest. Eleanor chose blooms ranging from burgundy to gold, including amaryllis ‘Lima’, cestrum ‘Cretan Purple’, cymbidium orchids, local strawflowers, and ranunculus. A small flower can easily get lost in a large arrangement amidst clusters of berries and bold leaves. To give small blossoms a bit more oomph, group them in trios or sets of five. 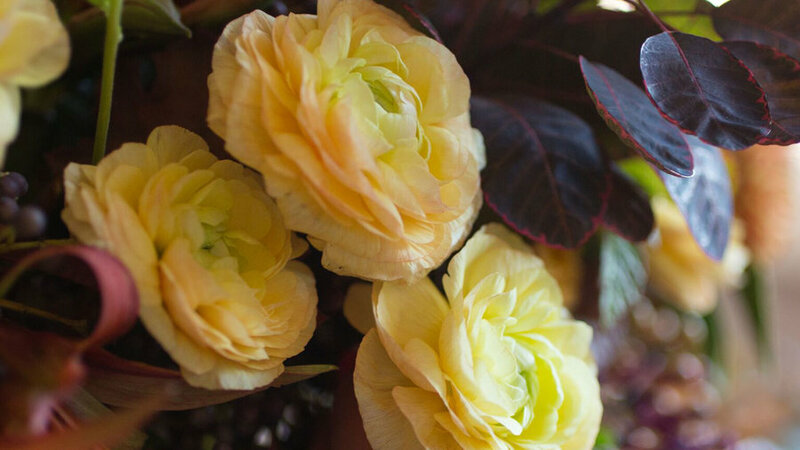 Here, Eleanor has tucked three 2-inch wide ranunculus rosettes for a sunny hit of gold at the base of the bouquet. 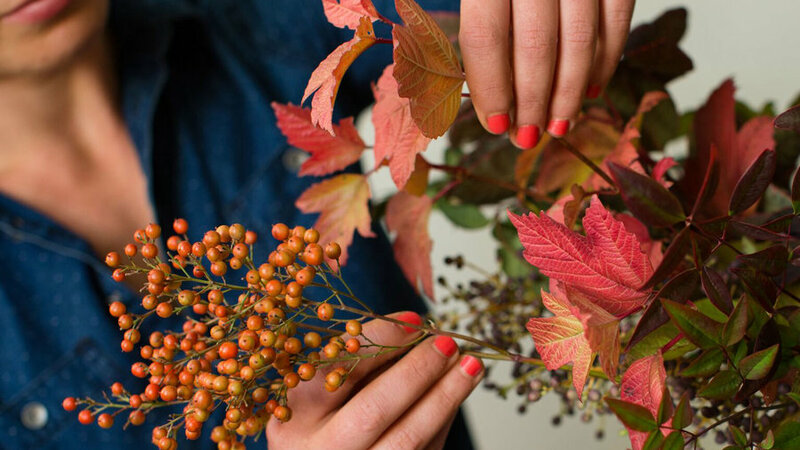 Play up the contrast by pairing bright-colored flowers and foliage next to dark tones. The deep purple smoke bush leaves act as a dark backdrop for golden cymbidium orchid sprays and brilliant red viburnum leaves—both of which nearly glow in comparison. To extend the vase-life of your arrangement, place it out of direct sunlight and well away from heat sources. Change the water every few days by carefully tipping the vase just enough to drain the water over the lip of the vase. Fill with fresh water and top off frequently as large arrangements can be thirsty. To keep bacteria at bay, Eleanor even adds a few drops of bleach to the fresh water.